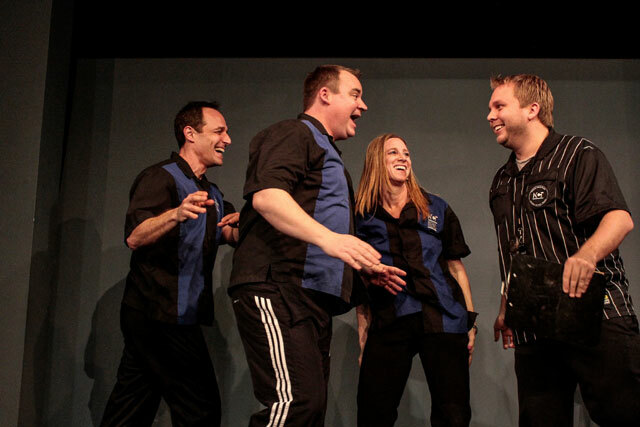 San Diego Improv Group Offers Classes For Kids and Teens! Many years ago, in my youth, I had the interest in performing, but I wasn’t very comfortable on stage. My parents wanted to support me in my interest in performing, so they enrolled me in an acting class. It was in this class that I was first introduced to improvisation, commonly known as “improv”, and developed the confidence to stand and perform in front of an audience. My acting instructor has long retired, but I was recently introduced to a local school that teaches improv to kids. National Comedy Theatre (NCT), the same organization that performs live family-friendly improv shows, conducts improv camps, classes, and workshops for kids and teens. The classes, camps, and workshops through NCT are held in their studio location in the Liberty Station area of San Diego, an area which has become the hub of instruction of the arts for youth in San Diego. 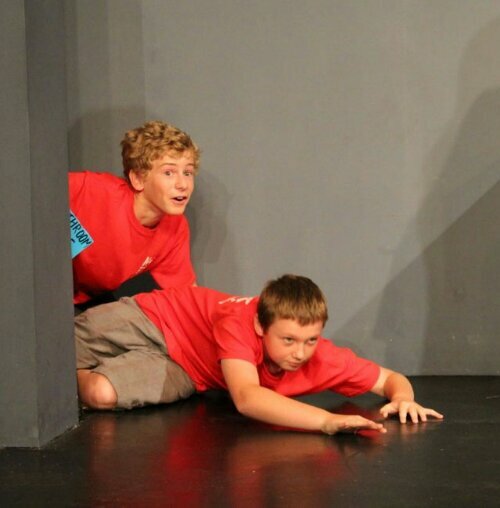 Improv classes are currently held from 10am-11:30am Saturday mornings for kids age 8-12 & for teens age 13-17 on Saturday afternoons from 12:30pm-2pm. They also offer camps and workshops throughout the year. A new session is starting soon! Click HERE for more details about youth improv opportunities in San Diego through NCT. We were recently invited to an evening improv show in San Diego. My initial thought was that it would be good to attend to see if this might be a fun Date Night or a Girls Night Out option to share with our readers. I picked up a girlfriend and off we went to see the live show. We arrived in Mission Hills, parked, and found National Comedy Theatre (NCT) nestled away at the top of some stairs high above India Street. When arrived we saw several young kids, probably around 8 years old, with their parents at Will Call. I kind of figured they must be progressive parents, alright with exposing their littles to language and ideas which are usually forbidden for youngsters. When we entered the theater I realized there more kids seated inside. LOTS more! I thought myself, I must be missing ~something ~. We took our seats, and waited for the show. A man went on stage, and gave us the run down on what to expect. He explained that it was improv, not stand-up comedy, and that although they took prompts from the audience, that it was a good, clean family-friendly show. The performance we saw was hilarious! The performers doing the improv were really well, and it didn’t appear that there was a bad seat in the house. The kids in attendance all seemed to love it, and the entire audience was laughing out loud throughout the show. I didn’t expect the entertainment to be a fun way to introduce children to the world of live comedy, but it turned out to be just that. As I expected, it would also make a great Date Night or Girls Night Out / Moms Night Out. NCT’s live performances take place in their theater on India St., in the Mission Hills neighborhood of San Diego. In this area you’ll find many restaurants, including El Indio, Shakespeare’s Pub, and Gelato Vero Cafe, to name a few. It’s a great location to have a bite to eat prior to a show. NCT has performed more than 3600 shows in their 13+ seasons, since their opening night in October 1999. It’s the longest continuously running show in San Diego history, and is clean and appropriate for all ages. Tickets range in price from $10-$15 each, and group sale options are available. NCT also conducts improv workshops, performs at corporate and private events, conducts team building workshops, and now offers improv classes and camps for kids and teens, as well as instruction for adults. For more information about NCT, checkout their website at this LINK. We truly enjoyed the show, and plan return with our children. My personal opinion is that it would be best understood and appreciated by kids age 8 on up. Perhaps we’ll see you there! Many thanks to National Comedy Theatre for inviting us to attend a live show. We had a wonderful time, and believe many of our readers would enjoy the show as well. It was seriously funny!